Working on the Plains of San Agustin takes Trevor and I to many an old homestead house and the inevitable meetings with the family members and descendants of those who first made this place their home. Some of them are my age but the elders remain also, often in the care of their children. I met one of these just yesterday, eighty nine years old, her fingers curled and useless, her body failing from a stroke which confined her to a wheelchair and her daughters care but neither challenge had robbed her spirit. Her blue eyes still twinkled with life and though she struggled with dates (who doesn’t!) she had a fine recollection of her life. Her parents had filed on some land many years ago. “A homestead?” I queried. 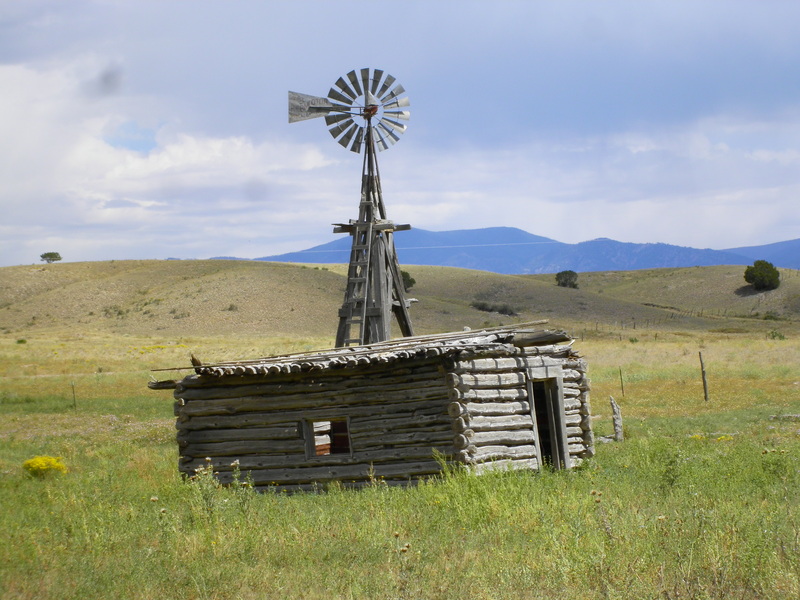 “Well yes, I guess so,” she replied, they had settled in Quemado. She herself had been born in Magdalena, according to my math in 1921, and at some point had come to live where we now met. She told me she and her husband had built this house in 1945 and later sold it to her daughter. It was a lovely place out on the plain, sheltered with trees and the surrounding buildings and having worked out there for several weeks we have come to appreciate the need for the windbreaks! In order to visit with her I had stepped away from the discussion of our work we were having with her daughter, preferring a rare chance for a visit and a piece of history. Instead I found a lively companion. Such life still sparkled in those old eyes and what a pleasure it was to meet one such as she who had lived so many years in this rugged country. What stories she must have to tell of her childhood adventures and the struggle they faced to survive! After I had asked her age I made a statement, “I hope to live to be 100 years old.” She quickly and clearly replied, “Would you?” with such seriousness and doubt it led me to correct myself. “Only if I am in good health!” I replied. She laughed sagely and the thought reminded me of how precious our lives truly are and how we should savor the finer moments such as these for someday we will be unable to relish them in quite the same way! Such sturdy stock these folks are! The women are handsome and strong, direct and honest with so few frills as those have been torn away by the wind and work many years past! We were reminded of this as a young girl came outside before we left. She still had a youthful blush on her pretty cheeks and revealed a reflection of the beauty which her mother, grandmother and great grandmother had been blessed with but not yet weathered by the wind and the effort towards survival. I wish I could have photographed them as a group to capture the progression of age for they were as peas from a pod in their resemblance to each other. The men are straight forward and friendly enough if not provoked but unappreciative of trespasses, they prefer forewarning of our visits and ask for some explanation as well. I have yet to investigate their common heritage but they are generally short of stature and slim, workers all! Of all their qualities I am most impressed by their resilience and perseverance as I study on their lives and their natures. They are a simple and determined lot, devoted to the requirements of their lives and keeping their cattle well fed and tended to whenever possible. Their gates and fences are strong and taunt, much as they are. This is such an unforgiving place there appears little room for mistakes or neglect, everything about it requires full attention. The effort is written on their hands and in their faces. The qualities people such as these possess are inherent to their natures and yet seem to be absent in so many others who I know. I have long attributed these characteristics to people who live in challenging places and these folks offer no exceptions. They are a close knit bunch, as much out of proximity as by necessity and the very fact they live so far from each other requires they pay heed to each other’s welfare. This quality is also based on the fact they are often kin to each other; few others could or would come to this place. Every time I have mentioned someone we met before the person we are speaking to will rattle off their relation to them either by birth or by marriage. This in itself seems to keep people honest as one will be quick to correct the others history! I so appreciate all of this and I am drawn to their community; I want more of this in my own life even as many of them likely envy my freedom also. They are bound to this place in flesh and spirit but are land poor as well and every effort is required to maintain their livelihood. In many ways they are as at mercy to the elements as their forbearers were and failure means a loss equal to what theirs would have been as their very lives depend on their cattle and their offspring. I have been reminded of something else by this journey through this country, its history, and its people. It is an aging perspective, one of my own as well as theirs and bearing a reminder that springs from both the old crumbling cabins as well as the sun weathered people. Life is so precious and even as we move through the rigors of our youth and adulthood so we age as well. The first half of our lives we spend building our dynasty and our families and then work our way through the middle of it. Just as we really get a chance to appreciate the glory of our existence we begin to age. My friend Dee McDaniel once told me, when he was 86 years old, that, “I was first a baby, then I grew to be a man and now I am a baby again.” So it is as we become frail and fragile, once again dependent on others and ironically (if we are so lucky) turning to the very ones we nurtured to look after us. There is such a reversal there and as we reach this turning point in our own lives we should view it from the same angle! We work so hard to get here, these middle years, striving towards a dream. Surely then we must give it full recognition and begin to savor it before it fades away so we will have and treasure those memories as we make our way towards the decline! I for one am grateful for the opportunity to do so.